The main contribution guide :doc: contributing was built for *nix systems, and the same commands may not work in Windows. Cygwin is a Windows tool, equivalent to *nix bash terminal. This guide helps to set up ODK Docs platform from the default Windows command prompt (CMD). The following are software tools that you need in the first place. If it is already installed. Just follow the steps and apply what is missing. These are a set of the main packages. ODK team combined them in a file such that all will be installed at once. Cygwin tool lets Windows users execute many *nix commands. Install Cygwin and add its path to Windows to work completely from the default command prompt. For instructions. If you encounter any downloading problems, make sure to select a mirror site near you. The entire list is available on the Cygwin website. You need to install Python 3. Select Python installation that fits your system (32 or 64 bit). For instructions, see. 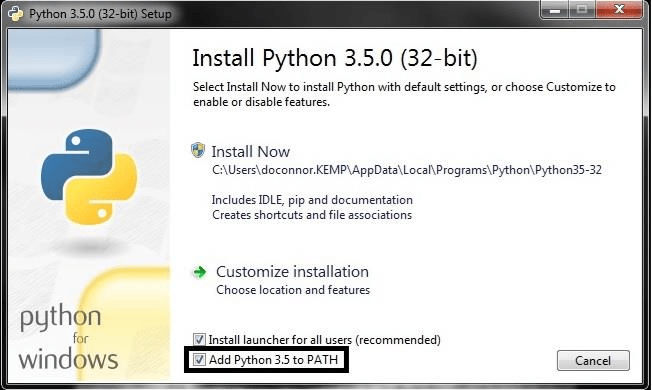 Make sure to select the option "Add Python to the Path", as shown below. C:/Users/your username/python3 is the default Python 3 installation PATH. If you change it, please substitute the above path by the new one. A virtual environment tool creates multiple Pythons environments, each has its packages and dependencies. 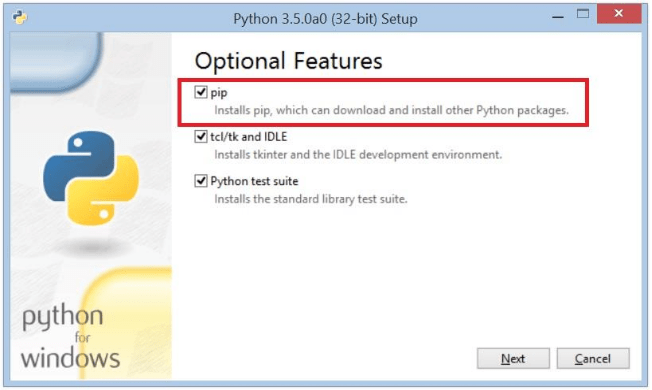 For easy installation, pip command can be used, which comes with Python 3 (as shown in Python installation). Use virtualenvwrapper on the top of virtualenv. Create a new Python 3 virtual environment, "odkenv" is the name of the virtualenv, you can choose any name. After creating the virtualenv, multiple files are copied into the folder odkenv in your working directory. The folder Scripts contains all virtualenv controls as ".bat" files. This step is not an alternative to virtualenv. You must install virtualenv first. Install Git for windows. Make sure that git is installed properly by typing (git) in the CMD. From Github, fork the ODK Docs. This will create a copy of the docs in your Github account called origin. Move to the ODk working directory, and clone the ODk Docs into your local machine. This step will install a bunch of packages that are listed in the :file: requirement.txt file. ODK team prepared this file for you to ease the installation. You completed the installation and you can start change and build ODK Docs.